Phase 2A Ribbon Cutting Celebration is set for Friday, May 11th 3:30 pm @ NARA Park in Acton. MassDOT is organizing a ribbon cutting celebration. The Town of Acton will host the festivities at NARA Park. The Friends of the BFRT are planning a festive celebration after the ribbon-cutting ceremony. In addition to refreshments and live music, all attendees will receive a commemorative yellow bandana with a map of the trail and refreshments will be served. As NARA park is directly on Phase 2A so you can access the celebration via the BFRT. In which case you might need a map of the BFRT with public parking. 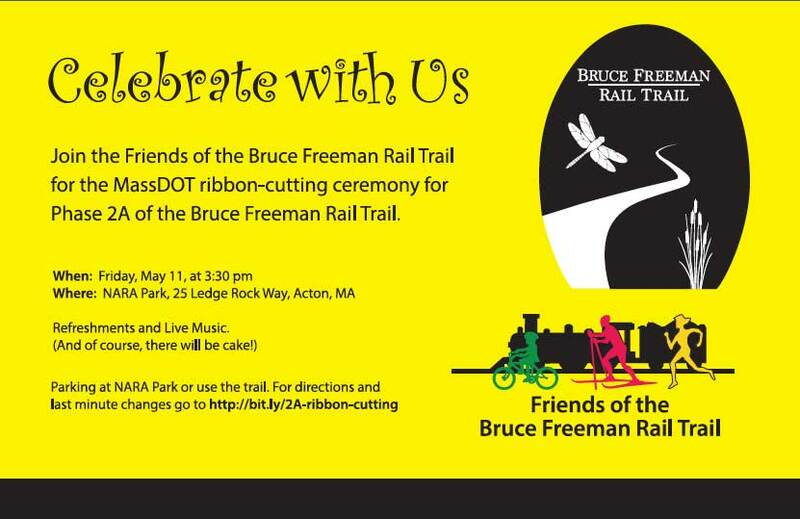 Join the Friends of the Bruce Freeman Rail Trail for the MassDOT ribbon-cutting ceremony for Phase 2A of the Bruce Freeman Rail Trail. See this trail map that now includes NARA Park and nearby parking for the BFRT if you want to use the BFRT to get the ribbon cutting by foot or bike. Please volunteer with planning for or day of logistics of the Phase 2A Ribbon cutting. Please email info@brucefreemanrailtrail.org with a quick note of how or when you can help.